Landscaping is far more than lush lawns and perennial gardens. G.A. Landscape Design & Associates specializes in creative, custom-built landscape structures that add architectural interest and enhance the usability of any yard or patio. Professionally constructed landscape structures like pergolas and outdoor kitchens add to the interactivity of your space: encouraging guests to eat, drink, socialize and commune with nature—day or night. Pergolas, patio covers and gazebos are an attractive way to provide relief from the New Jersey elements. Whether you’re barbecuing, relaxing in the sun or entertaining during the day, a custom-built shelter adds pizzazz and functionality to your property. Strategic lighting makes your structure useful during evening hours, as well. Arbors, pergolas and similar structures serve as a gateway to the rest of your outdoor environment. Arbors and trellises can also be used to divide your yard into separate areas for entertaining, gardening or other functions. Add color to your trellises and arbors with climbing vines and plants. 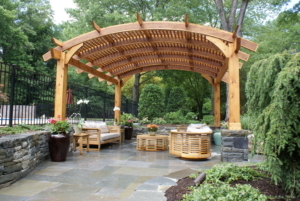 Custom woodworking structures support flowers and greenery while making a bold statement in your New Jersey yard. Providing elite landscape services across New Jersey, GA Landscape Design & Associates specializes in the fine art of landscape design. We are a regional authority backed by decades of collective experience, and our skilled craftsmen create outdoor spaces that will be enjoyed and admired for seasons to come. We’ll capture your imagination and shape a sanctuary ideal for connecting with nature, entertaining guests and expanding your living space. G.A. Landscape Design & Associates’ outdoor spaces are as practical as they are inviting. To learn more about our landscape consultation services or set up an initial design meeting, call our Westfield, NJ office at 908.789.1859. For your convenience, you can also send a message and a member of our team will respond shortly to answer your questions.